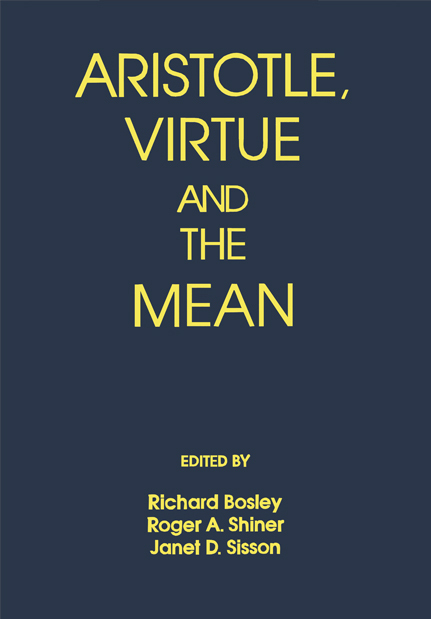 This volume considers virtue ethics as an approach to moral thinking and a reasoned alternative to standard objectivist and subjectivist ethical theories. These original essays examines the ancient sources of virtue ethics in Aristotle's ethical theory, and in particular the central doctrine of that theory, virtue as a mean between extremes of excess and relationship to contemporary ethical theory. `The essays all succeed in making advances on exegetical issues of theoretical significance' (Dialogue). `Unusually rich and enlightening discussion’ (Philosophy in Review). Contributors: Richard Bosley, David Glidden, Alphonso Gómez-Lobo, Stephen Leighton, Mark McCullagh, Janet D. Sisson, Francis Sparshott, George N. Terzis, J.E. Tiles, Thomas M. Tuozzo, William Welton and Ronald Polansky.